“7 Deadly Sins Every ERISA Fiduciary Must Avoid: The 5th Deadly Sin – Misapplied Asset Allocation,” (FiduciaryNews.com, June 9, 2015) Are our expectations of Asset Allocation too high? This is the first of a special five part series meant to be shared by professionals and non-professionals alike. “How’d an Innocent Fiduciary Like You End Up Asset Allocating?” (FiduciaryNews.com, June 10, 2015) Much of asset allocation marketing collateral is founded on a simple misinterpretation, yet this myth persists. Why? Like mice scratching for every last crumb, the government revenue collectors (including regulators empowered to fine) leave no stone unturned. What’s under your stone? “EBSA audit quality review a wake-up call for plan sponsors,” (Benefit News, June 8, 2015) Here’s an interview with a couple of AICPA folks that may prove enlightening. “It’s Not About Timing: IRS on Backdoor Roth Conversions,” (Financial Planning, June 8, 2015) Even if the topic doesn’t strike you, read the article just to see how journalism is being done in the age of social media. It’s not just a cliché, it’s a literal interpretation. “AARP delivers petitions on fiduciary standard,” (BenefitsPro, June 8, 2015) They amassed 5,000 signatures and they’re sending it to Chuck Schumer and Kirsten Gillibrand. Go Figure. “DOL Fiduciary Rule Out by May 2016: Lawyer,” (ThinkAdvisor, June 8, 2015) If they wait beyond that date, the new administration will squelch the rule before it’s had a chance to get off the ground. There’s a more interesting side story in this article about Elizabeth Warren attacking the DOL’s proposal from the left. “DOL fiduciary proposal feels heat as more industry players pile on,” (InvestmentNews, June 8, 2015) Doth the ladies protest too much? It’s getting to be downright silly what they’re saying. Will this damage their credibility in the long run, especially when their “sky is falling” predictions never pan out? “Small-plan market to suffer under new fiduciary regime: U.S. Chamber of Commerce,” (Benefit News, June 10, 2015) This makes no sense, but, honestly, the Washington D.C.-based US Chamber of Commerce succumbed to the Beltway mentality long ago. It’s a far cry from its bread-and-brother brethren – the local Chambers of Commerce that dot the landscape of America in Flyover Country. “Chamber of Commerce study fatally flawed,” (Employee Benefit News, June 10, 2015) Point, meet counter-point. Well, if you keep on talking about the same thing, is it any wonder that’s all you talk about? 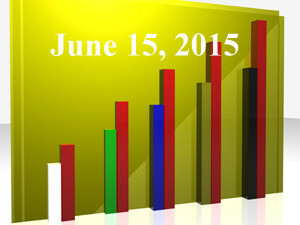 “No Surprise – Fees Remain a Top Topic,” (PLANSPONSOR, June 11, 2015) Surprise! Survey says this is all people talk about! There’s growing empirical evidence everything we’ve been taught about investments is wrong. But they money’s too good, so nobody seems to care. “Service providers biased towards their own mutual funds,” (BenefitsPro, June 5, 2015) How many red flags does this raise? “Will exposing the BHB myth destroy asset allocation?” (BenefitsPro, June 11, 2015) This will be considered a heretical piece by those practicing the asset allocation religion. But, be prepared, there’s worse news coming.